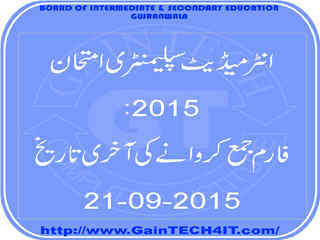 The BISE, Gujranwala has announced result of Intermediate Annual Examination, 2015 successfully without error on 12-09-2015. The result cards of Private candidates are sent to their home addresses and result cards of regular candidates are sent to their Institute addresses. You can know about your result with sms on 800299. If you did not receive your result card (original copy) till 20-09-2015, you can contact to related person from Gujranwala Board for a duplicate copy (free). In this regard the candidate can contact with Assistant Controller of Examination (Inter) on 9200751-55. Those candidates can’t get result card because of objections, they can get result card after solving their objection. The result cards are pending with objection of fee can be get after deposit remaining fee. You can download admission form on http://www.bisegrw.com, but no manual form will be accepted. You can read a basic tutorial for downloading Intermediate Supplementary Examination 2015 form here.